5F4 Tweed Super Clone from Lil Dawg amps! An amazing sounding amp in fantastic condition! Not only does this amp look great, but it will continue to inspire you to pick up your guitar and go for it! 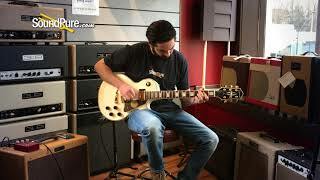 Huge clean tones are available with a nice dimensional sound. The SuperDawg is based on the narrow panel 5F4 Tweed Super circuit and offers a little hotter circuit for those needing a bit more out of their amp. The 2×10 speaker configuration and extra 12AX7 were just a couple of the differences that set the 5F4 apart from the other similar sized tweeds. Features are Normal & Bright channels with high & low inputs on each, separate volume controls, as well as shared bass, treble, and presence controls. meticulous lead dress and soldering. with the upgraded lacquered tweed option. premium "Vintage Series", not the cheaper "Signature" Webers. 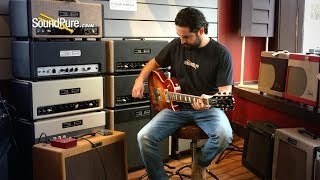 In this video, Sound Pure electric guitar specialist Michael Buckley tests out a pre-owned Epiphone Elitist Les Paul Custom with a Klon KTR Overdrive Pedal and a Lil Dawg Amps SuperDawg combo. 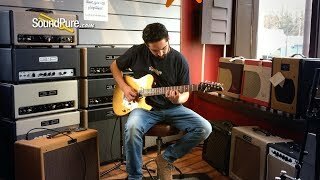 In this video, Sound Pure guitar specialist Michael Buckley demos an Anderson Cobra T Special Gold Top electric guitar, plugged directly into a Lil Dawg Amp SuperDawg. 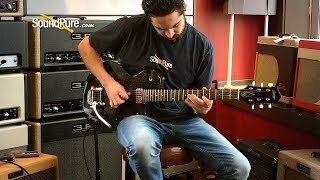 In this video, Sound Pure guitar specialist Michael Buckley tests out a Collings 290 Black Doghair with Bisgby electric guitar.